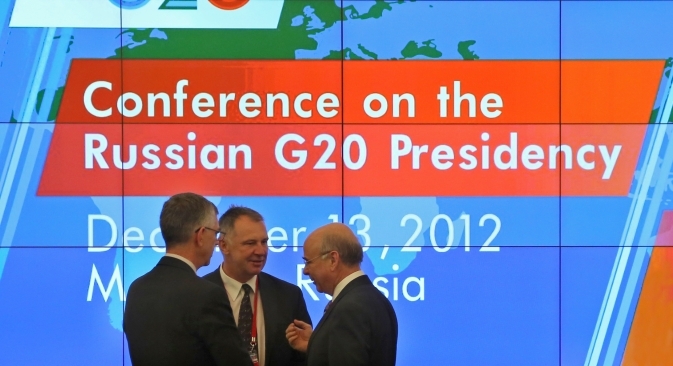 In mid-February Russia starts hosting the first G20 meetings of its presidency. The most challenging economic problems the world is facing today are on the agenda. Russia, to which Mexico passed the G20 presidency in December, is beginning to host the first meetings of the Group of Twenty Finance Ministers and Central Bank Governors. They will meet in Moscow for the first time on Feb. 15-16. These meetings will set the tone for subsequent meetings and discussions during Russia's presidency of the G20 in 2013. "I don't think the meeting should be approached with some kind of inflated expectations, because it is the first under Russia's presidency, an orientational one on a whole range of issues," a source in the Russian delegation told Interfax. He stressed that this meeting is important because it will not only determined the general range of topics to be discussed in the course of the year, but emphasizes a list of specific issues, solutions and problems. The finance ministers and central bank chiefs will have to agree on approaches to discussing given topics, work out a plan of action and in the course of the year implement measures to carry it out and find solutions. "Of course it wouldn't be right to call this meeting routine or inconsequential, but at the same time it can't be expected that the ministers will agree in February on all key decisions that will be put on leaders' tables," he said. In addition to the traditional topics, Russia will put two new ones on the agenda of the G20 meetings: financing of investment as a foundation for economic growth and job creation, and modernization of national systems of government borrowing and management of sovereign debt. Within the context of this discussion there will also be the issue of new targets for countries' budget deficits and government debt levels. "Of course this issue will be on the agenda, it is one of the key objectives within the context of implementing the G20 framework agreement for this year. I can't say that the issue is simple and that everyone has a common position, but it must be resolved, there is such a mandate from leaders," the source said. He said it is early to say that the ministers will agree on a new list of indicators, criteria and requirements that will be stipulated in the final document. "The process is quite complex, it requires taking into account all possible positions, points of view, all this requires time and here one can probably say that any concrete decisions - development of a list of indicators, levels, changes compared to the levels approved earlier - is a job for the meetings in Washington in April," he said. Deputy Finance Minister Sergei Storchak said earlier that Russia will face a serious challenge during its G20 presidency in structuring work in such a way as to adopt new targets for developed countries' budget deficits and government debt levels in the course of 2013. "Since we are now talking about stimulating growth, there is a position of let's roll back and see if regulators haven't tightened the screws too much. This already hangs in the air, and many politicians are trying to somehow resolve these issues," he said. Finance Minister Anton Siluanov said at the end of 2012 that for now most developed nations agree on the need to reduce government debt and budget deficits. He said there was less and less talk about the possibility of holding off on reducing debt and cutting deficits. "Most developed countries with a high level of government debt acknowledge that it is necessary to have reduction programs," Siluanov said. The issue of "currency wars" is not on the agenda of the G20 meeting in Moscow, but this topic will probably be discussed by the ministers, the representative of the Russian delegation said. "Right now this issue is not on the G20 agenda, it doesn't stand out in the agenda in general or within an individual topic. But it can't be ruled out that certain countries might identify this topic as important, perhaps propose the G20 turn its attention to it, determine its position," he said. The financial G7 issued a statement Tuesday in response to countries' concerns about certain developed nations easing their monetary policy and thus reducing the value of their currencies. European politicians have particularly criticized Japan for plans to weaken its currency. The G7 promised not to use economic policy to set exchange rates. "We reaffirm that our fiscal and monetary policies have been and will remain oriented towards meeting our respective domestic objectives using domestic instruments, and that we will not target exchange rates," the G7 ministers and governors said in a statement. Japan is reportedly expected to be the center of attention at the G20 meeting in Moscow. Reform of International Monetary Fund quotas will be an important topic at the G20 meeting. The G20 has already missed a deadline for preparing a new quota formula that was set for the start of 2013. Now the group will have to simultaneously tackle two issues - the new formula and redistribution of quotas on its basis. Siluanov said earlier that the G20 would hopefully manage to work out a solution on the new formula during Russia's presidency, before the summit of G20 leaders on Sept. 5-6. "The mandates that were given by time - the formula at the beginning of 2013, and the review of quotas according to the new formula at the beginning of 2014 - will have to be carried out simultaneously taking into account the current situation," a source told Interfax. He said the first proposals on the formula have been expressed by a number of countries, but there has not been a general discussion yet. He declined to comment on the substance of the proposals, as the approaches and parameters might change in the next few days. "By the end of the meeting, let's hope, some sort of clarity will emerge," the source said. The current formula for calculating quotas includes four indicators: average GDP (50 percent in the formula), openness (30 percent), economic variability (15 percent) and size of international reserves (5 percent). GDP in this formula is measured on the basis of market exchange rates (60 percent in determining GDP) and on the basis of exchange rates according to purchasing power parity (40 percent). There is disagreement on virtually every indicator, and while most IMF members agree the variability indicator should be excluded, there is no consensus on the other indicators. The G20 will also discuss traditional topics such as the state of the global economy, implementation of the framework agreement on ensuring strong, sustainable and balanced growth, promoting employment, reform of the currency system and system of financial regulation and oversight, the stability of global energy markets, promotion of international development, strengthening multilateral trade and fighting corruption. Siluanov will also hold bilateral meetings. The source said meetings are scheduled with World Bank President Jim Yong Kim and Singapore's Finance Minister Tharman Shanmugaratnam. The Organization for Economic Cooperation and Development will present its latest Going for Growth report on Feb. 15. In addition to the actual working meetings of finance ministers, deputy ministers and central bank governors, a number of seminars and conferences will be held within the context of the G20 meeting in Moscow. The seminar "Investment and Investment Finance: the Supply and Demand of Long Term Finance," organized by the Reinventing Bretton Woods Committee together with Russia's Finance Ministry, will be held on Feb. 13-14. The seminar will be attended by Deputy Finance Minister Sergei Storchak, Central Bank of Russia First Deputy Chairman Alexei Ulyukayev, World Bank Vice President Philippe Le Houerou, Russian Direct Investment Fund CEO Kirill Dmitriev, and Ksenia Yudayeva, Chief of the Presidential Experts Directorate and Russia's G20 Sherpa. The conference "The G20 Agenda under the Russian Chairmanship," organized by the Institute of International Finance, will be held on Feb. 14-15. It will discuss the agenda with a broader audience. G20 deputy finance ministers and Central Bank managers will meet on Feb. 14.